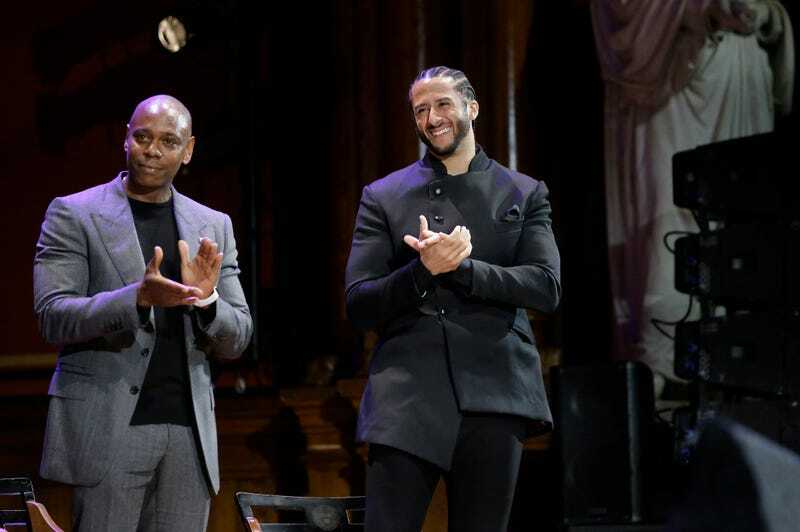 Comedian Dave Chappelle, left, and former NFL quarterback Colin Kaepernick, right, applaud during W.E.B. Du Bois Medal award ceremonies, Thursday, Oct. 11, 2018, at Harvard University, in Cambridge, Mass. Chappelle and Kaepernick are among eight recipients of Harvard University’s W.E.B. Du Bois Medals in 2018. Alas, to be a fly on the wall at Memorial Hall at Harvard University Thursday afternoon. The room’s very air would be perfumed with the sweet scent of black liberation and excellence as eight prominent, distinguished, and mostly freedom fighting African Americans received the University’s prestigious W.E.B. Du Bois Medal from the Hutchins Center for African and African American Research. Harvard has awarded the medal since 2000 to people whose work has contributed to African and African-American culture, and former honorees include Muhammad Ali and Maya Angelou. Thursdays honorees included: Former NFL quarterback Colin Kaepernick, a staunch advocate for social justice; comedian Dave Chappelle; Kenneth Chenault, chairman and a managing director of General Catalyst (JD ‘76); Shirley Ann Jackson, president of Rensselaer Polytechnic Institute; Pamela Joyner, prominent art collector and philanthropist (MBA ‘84); psychologist and author Florence Ladd; Bryan Stevenson, founder and executive director of the Equal Justice Initiative (JD ‘85, MPP ‘85, LLD ‘15)—obviously the most overachieving of the bunch—and artist Kehinde Wiley. Photos and video from the evening showed the above honorees and Dr. Cornel West, who returned to Harvard last year with a joint appointment at the Harvard Divinity School and the Department of African and African-American studies as well as Dr. Henry Louis Gates, director of the Hutchins Center (and chairman of The Root). Kaepernick also called on the people in the room to stand up for those in need. The controversial former footballer, who also spoke about his deal with Nike, requested that the speech not be broadcast. Alas, to have been a fly.